A large part of the game of basketball is understanding the surrounding circumstances. With this comes a time and place where pushing it in transition makes sense. However, there will be other times where it makes more sense to slow it down and set up an offense. Some teams favor getting up-and-down to score in transition, while others take a more methodical approach. This article will take a look at the both methods that strive to effectively and efficiently score the ball in transition. Before I get deeper into specific drills to improve your own abilities in handling and moving the ball up-court in transition, I thought it would be best to provide you with details on why and when it works. First off, it can easily produce some quick points. If the defense doesn’t get back right away, lay-up opportunities will be available. This leads me to the next advantage, which is the fact that it pressures the opposition to get back quickly. As a result, you may see more rushed shot attempts or less aggression in attacking the offensive glass: both positives for the team choosing to get out fast in transition. Lastly, it allows for more players to see court time. Due to the up-tempo nature it creates, coaches are forced to sub players in-and-out more frequently. This creates a more unifying culture and prevents any egos from forming in the locker room. Get It to the Guards! The most important tip for running the ball in transition is to get the ball in the hands of a guard immediately. Upon getting the defensive rebound, all forwards and centers should look to a guard as the primary ball handler. In order to so, a guard needs to hang back to provide a receiving option for the forward to pass to. It’s also important to point out that you can still run a transition offense even off a made basket. In order to implement this, coaches should designate one player to be the full-time in-bounds passer. This will speed up the overall process and ensure there are no situations where no one is there to throw in. Ultimately, all young players must understand that if they’re a forward or center, the first order of business should be to get the ball in the hands of a guard. Guards train to develop their ball skills to handle the rock in tight situations. For young guards, I recommend continuously working on these abilities. This video from CoachTube provides a number of incredibly helpful tutorials to learning new moves. Practice these and make them seem second-nature! When younger players hear the coach talk about implementing an up-tempo, transition offensive strategy, it can be exciting. After all, you’ll get the opportunity to push it every time and likely get a few easy lay-up chances every game. However, the key is to stay under control and know when to push it. You won’t be able to play the transition game after every missed shot. Additionally, the opposition might focus more on getting back if they get burned by the transition a couple times. With this said, if you’re the guard, you need to pick and choose times to speed it up. At the same time, when you are handling the ball in transition, keep your head up. It’s vital to constantly be gauging the surrounding circumstances and looking for passing lanes. Also, never force it into the paint if the defense is already set up. Sometimes this will result in a pair of free throws, but more often than not it will be a charge or a careless turnover. 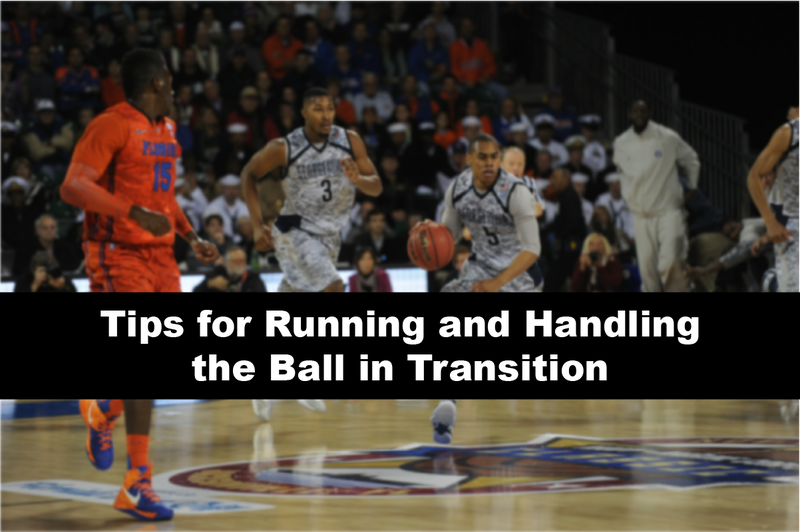 I’ve already started to delve into some of the basics of playing in transition, which has included getting the ball in the hands of the guard and staying under control. The next element is for the other players to know their roles. Typically, coaches preach for the point guard to receive the outlet pass from the rebounder in the middle of the court. At this time, the other guard and small forward should be racing up the sidelines. The power forward will follow slightly behind the point guard to present yet another opportunity. Lastly, the rebounder (the center in this case, but could also very well be the power forward) will serve as the trail man. The center’s roll is to present a backup option, possibly as a pull-up three, or the emergency defense in case the transition chance goes awry. Each of the particular lanes may change based on where the players are at the time of the rebound, but the key is to fill each of those lanes. This gives the point guard the most room and options to work with. A couple of the more common fast break/transition opportunities that there will be are the 2-on-1 and 3-on-2. Many coaches practice each of these a decent amount in practice, as there easy to train with and are perfect game-type situations. In this section, I’ll provide a few helpful hints that I’ve taken away from my playing and scouting experience. On the 2-on-1 break, I believe it is most effective for the ball handler to take a shoot first mentality. As he or she is racing up the court, they should utilize their peripheral vision to see where and who their teammate is and where the opposition is. The reason why I say “who” is because certain players like bigs may be more adept at catching a lob rather than a pass where they have to put a dribble down. With this shoot first mentality, attack until the defender makes a decision and picks one of the two offensive players. With the 3-on-2, you have to remember to keep the ball in the middle of the court. Otherwise, it becomes much easier for the defense to prevent all passing lanes. Most of the time, with these situations, I like the point guard to stop around the free throw line and make the open pass. One of the defenders will likely pick up the ball handler, while the other will choose one of the two wings. In the times where the defenders pick up both wings, go straight to the hole and either finish with a layup or a floater. At all costs, avoid overpassing, which can easily end in a turnover and missed opportunity. In the end, the best way to become a more effective player in running and handling the rock in transition is to do it in actual games. Doing so will increase your confidence that you can consistently make the right reads and get the easy bucket. You’ll become more comfortable reading defenses and knowing when to push it and when to slow it down to run the offense. Transition offense can be very exciting, but while any play can look like a potential transition opportunity, not every chance is going to work out!